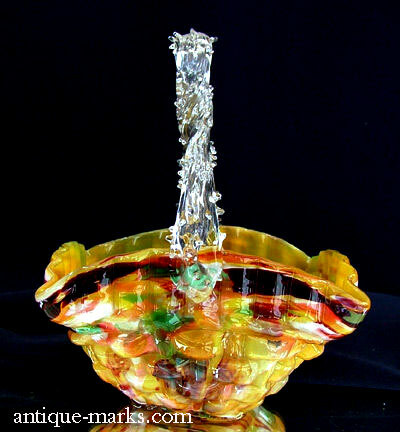 From the antique-marks collection we have a wonderful Nailsea Glass Basket roughly formed from various pieces of coloured glass spatter with a clear glass, twisted branch handle. 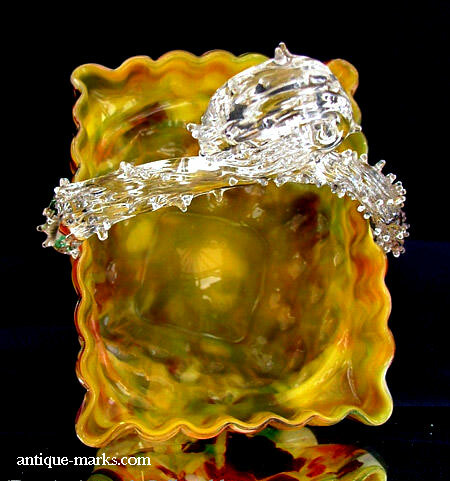 Possibly 19th Century and highly collectable Nailsea glass which included this type of decoration, with white and sometimes colored splashes on a dark green or amber glass. Spatter glass was extremely popular with Victorians in the late 19th century, along with many other Roman and Egyptian glass styles. 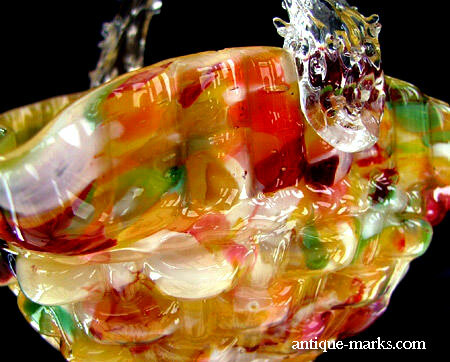 Spatter Glass is actually hand-blown glass which has been rolled over a hot steel or iron plate to pick up small chips of crushed or powdered glass on the outside. The glass is then rolled smooth and shaped by blowing. 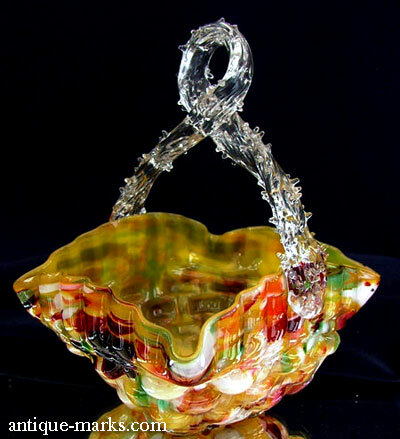 This Nailsea Glass basket is in very good original condition, with some traces of wear. 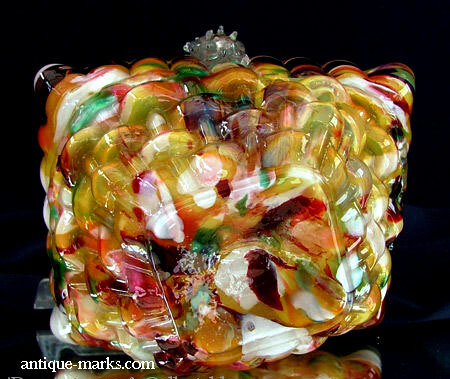 A few small burst air bubbles here and there and typical imperfections found in early glass. No cracks and the bowl rings like a bell when flicked with a finger. Makers marks provide a reasonably reliable dating system but typically, there are no makers or factory marks present on antique glass. Northwood Glass carnival wares are one exception. However, the presence of an indented and polished pontil mark to the base of this Nailsea glass basket, demonstrates the hand blown manufacture and the excellent quality of the glass. It is uncertain when glassmaking first started in Nailsea but Nailsea Crown Glass and Bottle Manufacturers “The Nailsea Glassworks” was one of the new factories that opened in the Victorian glass boom. Nailsea was first set up by John Lucas in 1788. Nailsea Glass became widely used by the 1830’s and the glassworks expanded to become one of the four largest in England. Because of the heavy duty on 18thC Flint Glass, it became common practice for glassworks like Nailsea to manufacture tableware out of bottle or window glass, and to decorate it very simply with white dots or lines to make it more attractive. Nailsea Crown Glass and Bottle Manufacturers were just one among many glassworks that manufactured this type of glass and they gave their name to this style. 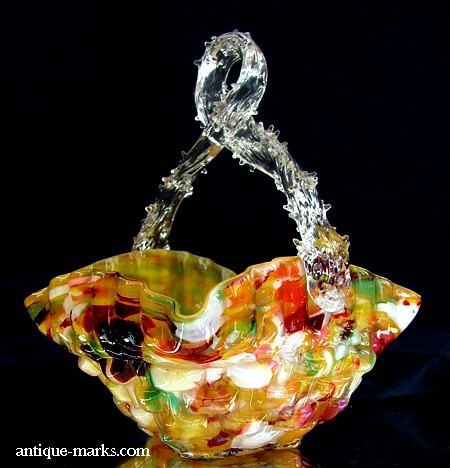 The flecked and festooned glassware such as this Nailsea spatter glass basket, included jugs, carafes, vases, bowls, paperweights, twisted canes, rolling pins, pipes and jars. 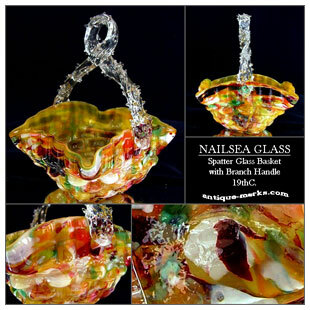 All of which are now highly collectable glass items and collectively they are often simply referred to as Nailsea glass.